Dr. Helen Pearson, Cardiff University's European Cancer Stem Cell Research Institute, said: "We've identified a new genetic mutation that may drive the growth of prostate cancer cells. In our research, we found that when prostate cells were given a mutation in the PIK3CA gene, they rapidly formed tumours that developed resistance to hormone therapy. "Our findings indicate that people who are carrying a PIK3CA genetic alteration are highly likely to develop resistance to hormonal cancer treatments and have a poor treatment outcome. "We also found that both PTEN and PIK3CA genetic alterations are present in prostate cancer, and that they can work together via potentially independent mechanisms to accelerate the development of the tumour, as well as causing the cancer to become resistant to hormone therapy. 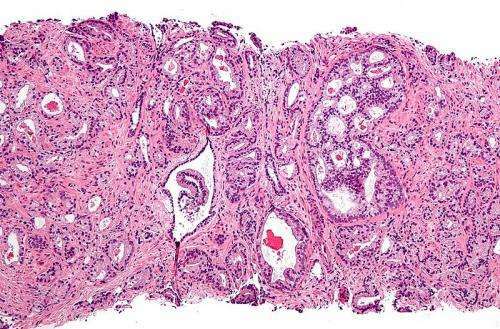 "Survival of patients with castrate-resistant prostate cancer is poor, so it is vital to develop novel and targeted treatments for this aggressive disease." Professor Wayne Phillips, from the Peter MacCallum Cancer Centre, Melbourne, Australia, added: "This research gives a new insight into the development of prostate cancer, and provides a foundation for new targeted therapeutic approaches to tackle this disease." The article 'Identification of Pik3ca mutation as a genetic driver of prostate cancer that cooperates with Pten loss to accelerate progression and castration-resistant growth' is published in Cancer Discovery.